Traditionally green mungbeans have been enjoyed as a healthy vegetarian dessert: see our Recipe for Mungbeans in Sugar Syrup. Today, eating fresh sprouts is a very healthy new popular trend in Thailand and elsewhere in Asia, as people have discovered that sprouted beans are packed with nutrition. More vitamins, and more enzymes which make you feel younger. Try dabbling in the raw food diet, enjoying the highest quality Thai mungbeans--and it's FUN! The flavor is just like the freshest green peas. Simply put 1/2 cup beans in a jar, cover with plenty of water, cover the jar with a double layer of cheesecloth, secure with a rubber band and let stand for 24 hours. Drain and rinse the beans through the cloth, then store the jar in a dark place on its side, propping up the base so excess water drains onto paper towels. Rinse and drain twice a day. After just 36 hours, the beans will grow tails and be ready to eat! Rinse well, cover the jar loosely and refrigerate for up to 3 days. 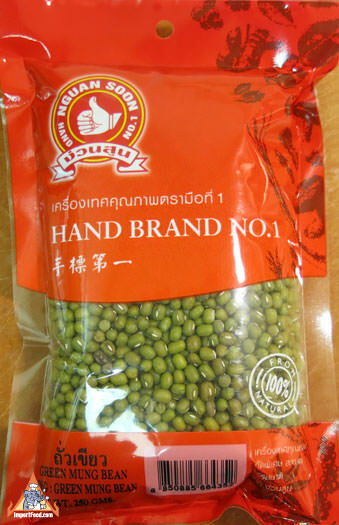 Hand Brand has packed the finest local Thai mungbeans for us to introduce it to our customers. We sprouted some in a jar and they were really delicious. Eat them as live sprouts or top your salad, or add to soups. Each 8.8 oz package contains about 1.5 cups of mung beans. Ingredients: green mung bean. Product of Thailand. 2. Cover the jar with a double layer of good quality Thai cheesecloth, secure with a rubber band and let stand for 24 hours. 3. Drain and rinse the beans through the cloth, then store the jar in a dark place on its side, propping up the base so excess water drains onto paper towels. 4. Rinse and drain twice a day. After just 36 hours, the beans will grow tails and be ready to eat! Best taste is when the tails are slightly longer than the beans. 5. Rinse well, cover the jar loosely and refrigerate for up to 3 days. We also offer all natural mungbean noodles, and mungbean flour.